High-touch meets high-tech–personalization with less human interaction is keying into customer needs. Over the past few years, banks have added mobile banking, enabling customers to deposit checks by taking pictures of them with smartphones. Banks have also extended their online banking offerings, so that customers can have more convenience to bank when and where they choose, and to take advantage of upgraded ATMs. The advanced models provide change, pictures of deposited checks and other enhancements. Mobile deposits are growing quickly at financial institutions because they benefit the customer and the financial institution. A high percentage of branch transactions are to deposit a single check, costly for the customer in terms of time and costly for the branch in terms of overhead. Taking a picture of the check and transmitting it is much more convenient because the trip to the branch–or even the ATM–is eliminated. In addition to mobile banking and advanced ATMs, Northwest Indiana banks, like their national financial institution competitors, offer online bill payment, electronic person-to-person payments, online statements and various other electronic products and services. First Merchants upgraded its online bank offering earlier this year to offer customers running balances on accounts, clearer views of checks, better ability to link accounts, and the ability to interface with financial software. The bank also extended its call center hours–providing customer service earlier and later–to help customers with technology and other banking needs. In addition to these customer-facing technologies, there is new hardware and software in the branches and back offices to make the banks more efficient. With these technologies, customers no longer need to go into the branch to conduct transactions, nor do they need to talk to anyone for the most basic banking needs. electronic person-to-person payments, online statements and other electronic services. But the technologies shouldn’t be seen as impediments to personal interactions with customers, according to regional bank executives. Instead, these technologies remove many of the mundane branch transactions so that bankers can concentrate more on providing customers with advice and their more complex financial services’ needs. Some of the nation’s largest banks have added electronic-only banking accounts for which customers are charged for any non-electronic transaction. National banks offer these accounts with lower initial fees than other accounts. However, branch transactions have declined at all banks, not just those with electronic-only accounts, a trend that is expected to continue. Millennials, in particular, have shown a tendency toward electronic banking, and they are becoming a larger percentage of the banking population. With the decline of in-bank transactions, Peoples Bank and other Northwest Indiana financial institutions have redesigned some of their branches with fewer teller windows and more space dedicated to personal financial consulting, which requires more privacy. Bochnowski’s thoughts were similar to those of top representatives of other Northwest Indiana financial institutions. To aid customers with that effort, Horizon has installed “smart” ATMs that print receipts for the amount deposited and provide cash back from deposits as well as offering other advanced features. Horizon uses not only technology to help serve those schedule needs, but also has supermarket branches that enable customers to bank during their weekly trips to the grocery store. The supermarket branches have extended weekday and weekend hours. Nearly half (49 percent) of the bank’s Northwest Indiana customers use some sort of electronic services, with one-third using ATMs and more than 10 percent conducting at least a portion of their banking via smartphones. “This gives us an opportunity to spend more time with customers–not so much on transactions, but on their future goals like savings, retirement and home ownership,” Smith says. With banks focusing more on financial consulting at the branch, branch personnel are receiving more cross-training on different financial products and services so that they can discuss them knowledgeably with customers, Buhle says. By being more knowledgeable, the branch personnel can provide more personalized interactions than they could if all they were doing was handling deposits, withdrawals and other transactions. When the customer’s need warrants it, First Financial bankers will also go to the home, business or other location to start a loan application or conduct other non-transactional banking business, Schneider adds. Customers enrolled in online banking use First Financial’s Panorama Finance Management technology to get a full picture of their financial position by entering their financial information from all sources. Banks have used financial management programs for a few years to provide customers with a way of having more insight into their financial position, including expenses, income, assets, liabilities, etc. These programs also provide the banks with competitive information about relationships that customers have with other financial service providers, which bank marketing departments use. The move toward technology and electronic transactions has also meant a shift in the way that financial institutions communicate with their prospects and customers. Branch transactions had always offered the opportunity to make personnel connections with customers as well as to inform them about additional products and services that they might be able to use. 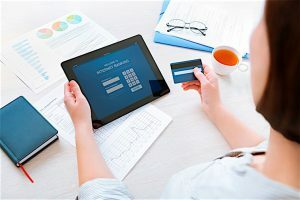 While some customers will still go to the branch on their own to seek this type of information, the opportunities for this face-to-face communication have declined. Northwest Indiana banks have responded to this change by developing social media sites, producing blogs, stepping up some of their call center outreach and extending call center hours to go along with the traditional print and radio advertising. Some of those opportunities include calls from the banks. While many people don’t like call center contacts, they are more receptive when it comes to calls from their banks, which can include communications about potential issues with an account and occasional “check-ins” as well as offers of additional products and services and scheduling of meetings with bankers. Peoples offers a dedicated trust and wealth management department with fully licensed representatives to work with customers on short- and long-term financial planning needs. While industry experts and Northwest Indiana banking executives agree that the trend toward technology and electronic transactions and away from the branches is likely to continue, any discussion about the demise of the branch is largely overdone, they agree. Some of the nation’s largest banks, like Chase and Wells Fargo, have closed some branches and have consolidated others, but Northwest Indiana banks have maintained their locations–though some have been redesigned with fewer teller windows and additional open space–and have no plans to shutter any locations in the near future. The “death of the branch” talk actually started when ATMs first started becoming prevalent in the 1970s. But customers will always have financial needs that ATMs and other electronic devices won’t be able to fill without human interaction between the bank and the customer.